Although it is only the beginning of October, the holiday season is upon us and some stores are already in full swing in getting the word out there about their particular products. With that said, I have curated a list of toys that I believe are some of the best in regards to their purpose and how well they can be an integral part of the special needs community that encompasses children of all ages. Each and every one of these toys are special in their own way while working on the skills that are of utmost importance in the life of all children but especially for a child with special needs. A child with special needs has to work at least 10 times harder than most in order to achieve the same success. As a parent, securing the tools needed to help your child gain the skills and reach the success that they are so capable of is a must. My goal in curating not only this list but my previous lists as well are there to inform, educate and assist in making your child’s life easier but your whole family’s life as well. It is a collaboration that takes many parts to make the puzzle whole. Once all the pieces are in place, the gains and accomplishments begin to surface. I hope you find this list helpful along with all the toys I have listed previously in my prior blog posts. In my opinion, any child would love to receive any of these toys. Learning can and should be fun. It’s what you make of it and how you choose to approach and address it. I wish you and your family a very happy and healthy holiday season. Who doesn’t want a little calm in one’s life. This pillow vibrates when you touch or hug it but it stops when you let go. 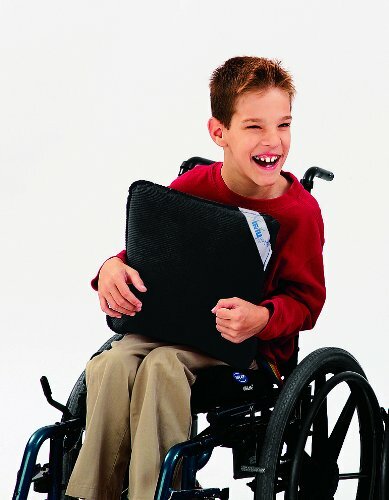 This pillow is for everyone from kids to adults, no matter what your age or need is. Keep in mind, it does require 2 “D” batteries so you’ll want to have them on hand when gifts are opened! This toy is fantastic as it has numerous uses. Not only can it be used for matching shapes but for teaching colors and counting. The pegboard is made from foam so it is safe and the pegs are oversized so they are easy even for the littlest of hands to maneuver. 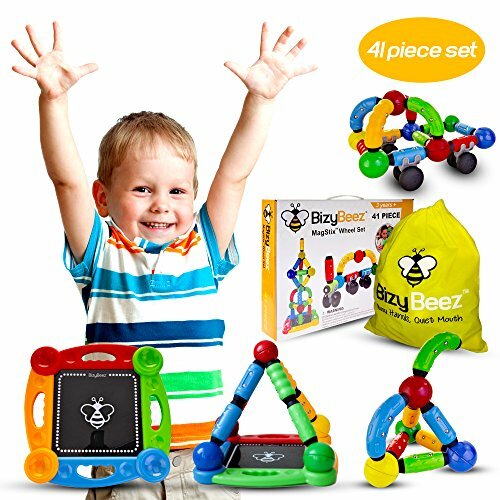 The pieces also help with fine motor coordination and it all comes in a super easy and transportable bag so you can bring it with you on any trip away from home. I also love this toy because the pieces come in 12 different bright colors as well as 12 different shapes. Also, the toy is great for girls and boys! You will keep coming back to this toy again and again. Who doesn’t love a little friendly competition? This balance board assists with stability, coordination and spatial awareness - just to name a few. But wouldn’t it be fun to see how long your child could balance on it? With each time, you could log the time and each time after, your child could try to beat the last time. This way they are in competition with themselves and it helps with their gross motor skills. This toy is safe for your kids as it made from non-toxic plastic. The colors are awesome! They are bright and fun and allows for your child to use their imagination and build anything they want. This toy is great also because it comes with a play board that is portable. Having this play board allows your child to build on it and therefore gives their creation the stability needed. The sticks have various textures so it helps with sensory and tactile stimulation. I love this toy to travel with, wherever your child may go. 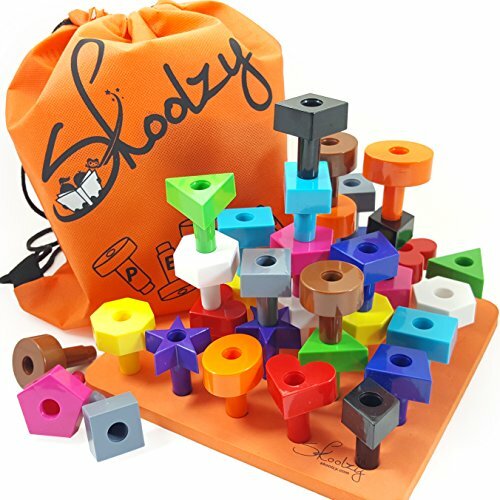 With the portable play board and bag that fits the pieces, it is a “go to” whether at home or away. This Teeter Popper is made for kids up to 110 pounds. It is a bright green with bright blue suction cups on the bottom so it is happy and engaging. 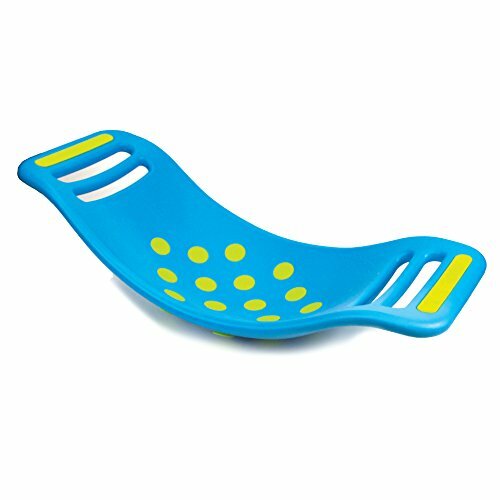 The suction cups make a “pop pop” sound when the child sits on it, rocks on it or stands on it. 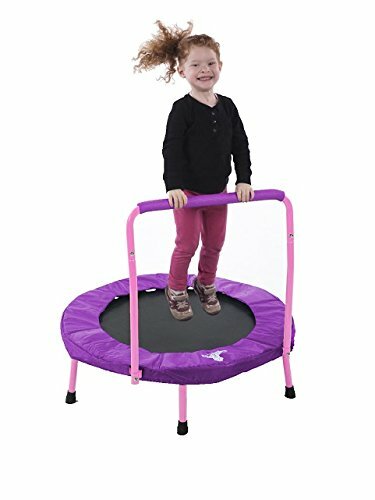 It has a number of advantages as it helps a child’s core, balance and gross motor skills, just to name a few. I love this toy because it is easily portable and can be used inside or outside. You can also use it to time the child as to how long they can stay on it and continue to practice until they break their previous record. This toy has the coveted distinction of being ASTRA’s Best Toys for Kids Award 2014. 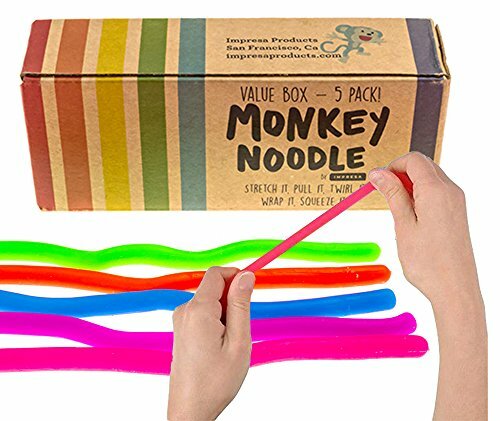 Impresa Products 5-Pack of Stretchy String Fidget / Sensory Toys (BPA/Phthalate/Latex-Free) - Stretches from 10 Inches to 8 Feet! This toy is so much fun! You can stretch it, wrap it, twist it and more. The colors that it comes in are awesome - Super bright! These are great for kids and adults as it can be used to decrease stress and anxiety. As a parent, you don’t have to worry about the materials as it is BPA, phthalates and latex free. The best part of playing with this toy is that the strings start out at being 12 inches long but stretches out to 8 feet long. How cool is that? This toy is great! 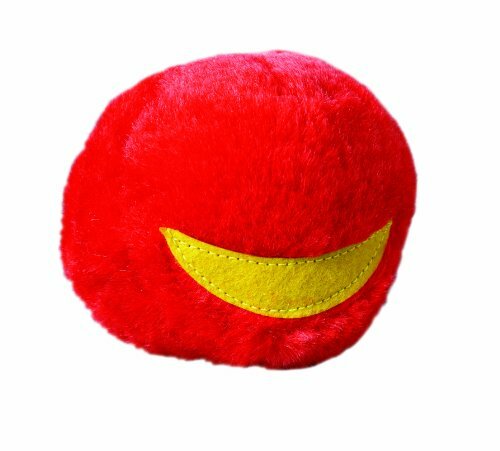 It is happy to look at as it has a smiley mouth on it. It is bright in color and easy to follow when thrown. It is fantastic for eye - hand coordination. Since it’s soft and cushy, it feels good to handle. The best part is that it laughs when you push on it, so it will always bring a smile to your child’s face. Also, the ball is 4” in diameter so it is the perfect size for kids to handle when throwing or catching it. Kids love music. I can’t think of a better way to introduce kids to different ways to make music. This set is made for 6 months and up. It is never too early to start your child with the gift of music. 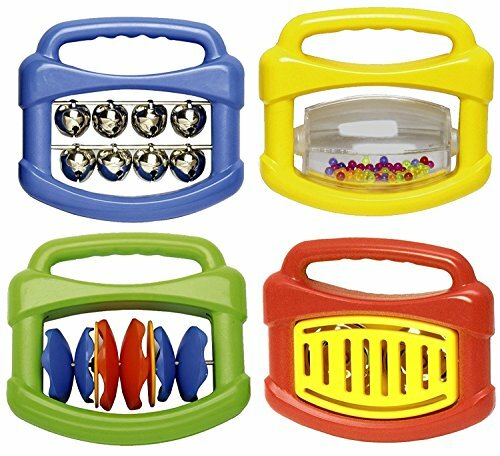 Each instrument (set of 4) are brightly colored with a handle to grab onto. Each instrument makes different sounds so you can build your own band at home. This is a 13 piece set that includes the cutest cookie jar to use as storage. 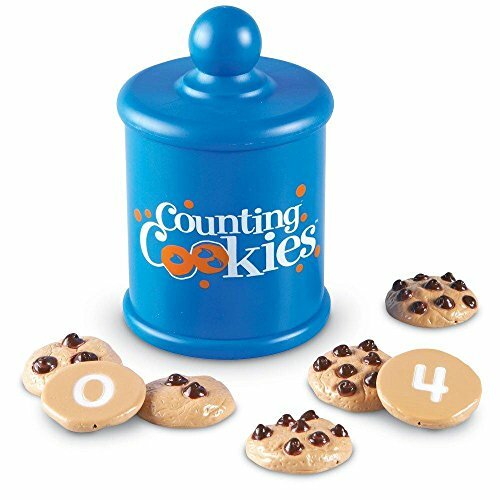 The cookies are chocolate chip with the number of chips printed on the bottom of each. This toy is great for gross motor skills, building the child’s counting skills along with number recognition. The cookies are great for tactile stimulation as well. Don’t we all wish we could have such a cute cookie jar? What a great way for your child to work out that extra energy. Plus it’s great for physical fitness! It is very easy to assemble as the legs screw on and the handle gets attached. Once that is done, your child is ready for a jumping workout. It’s portable as well: just unscrew the handle and legs and you are good to go. It can also be used inside and out and it can accommodate kids up to 150 pounds. Having good oral health is important for everyone. 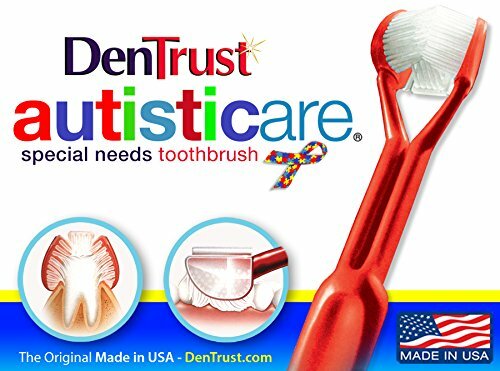 However, for a child with special needs brushing their teeth may present a challenge. This toothbrush has soft bristles which can make brushing quicker and more efficient. This comes in a 6 pack so you will have plenty ready to go when needed. After all, who doesn’t love a sparkling smile? Do you want to challenge your child? Then this is the game for them. It is great for boys or girls ages 8 and up. 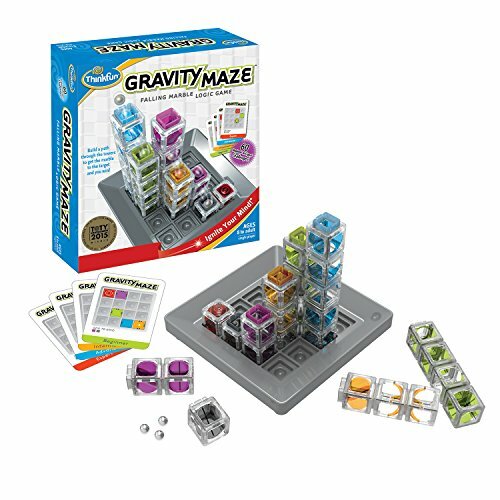 Not only does this game build spatial reasoning but helps with developing critical thinking skills as well. There are different levels from beginner to expert so your child will not feel overwhelmed. This toy is great as well for the whole family to challenge each along with your child’s friends. This toy is the winner of several awards as well. So, challenge yourself and your child. How good are your skills? 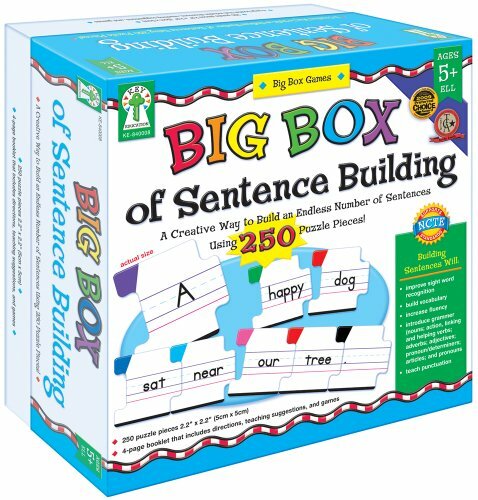 This fantastic box has 250 puzzle pieces with 4 blank write on/wipe off pieces. The 250 pieces are color coded with the parts of speech they represent so your child can build sentences. Your child can not only learn and recognize words but understand what and where they belong in a sentence. There are numerous games you can play while working on grammar, sight word recognition, fluency as well as punctuation. This is great for the beginner as well as boys and girls. It also helps with fine motor skills as well. A 4-page booklet is included as well with some suggestions as how to use this toy. This toy was also a winner of the Creative Childs Award. 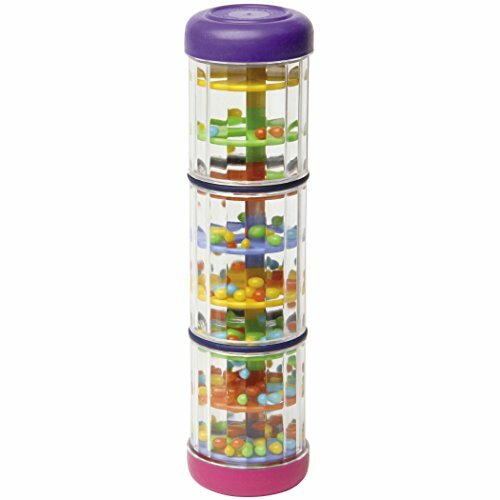 This toy is great for kids of all ages as it works on a child’s fine motor skills in a fun way. This set comes with 30 super colorful beads along with 2 laces. 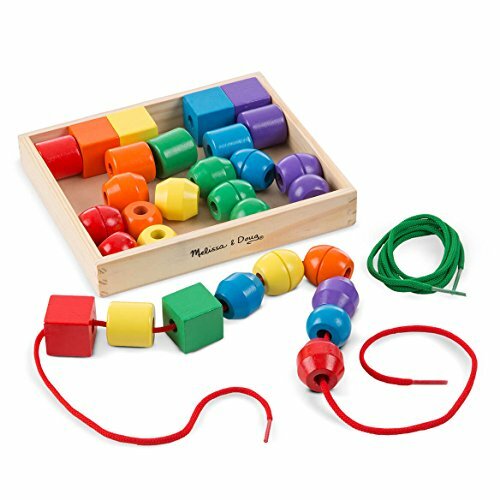 Not only can you use it for fine motor skills but you can also use it for color recognition, shape recognition along with matching and counting. Personally, I love any lacing activity as the benefits of it are visible across the board whether a child is special needs or not. 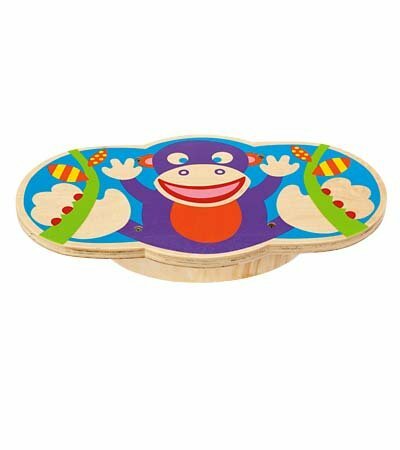 This toy also comes in a wooden box that you can store it in when it is not in use. This is a MUST- holidays or not. This is made of waterproof/weatherproof material that has bright colors which are very visible. 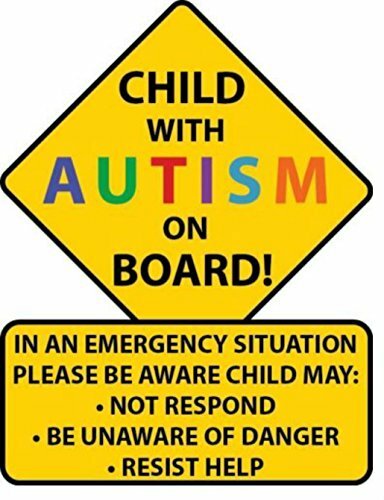 This sticker speaks for your child if they cannot. Your hope is that it will never be needed but if it is, it makes it much easier for responders. Need immediate insight into your child’s situation and how to address their current issues? Schedule your Open Opportunity Session for an expert analysis and strategic plan you can implement today. I participate in the Amazon Services LLC Associates Program, an affiliate advertising program designed to provide a means for sites to earn advertising fees by advertising and linking to Amazon properties such as amazon.com and affiliates. If you purchase an item with a “BUY ON AMAZON ” button, I may receive a small commission at no cost to you.